Ethical and Justice Issues In Contention At the Warsaw Climate Negotiations-The First In A Series Of Reports. Negotiations on the international climate regime have begun in Warsaw at a time when the scientific community, including the IPCC in its recent report on the Physical Basis for Climate Change Science and UNEP in its just released Emissions Gap Report, are advising the international community that the world is running out of time to prevent dangerous climate change. 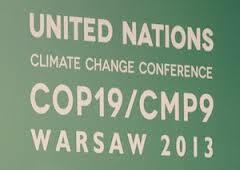 The Warsaw agenda includes numerous topics that raise profound ethical and justice issues which not only must be faced to achieve a global climate change solution but which are also increasingly at the center of the most contentious issues in the international climate negotiations. Despite this fact, the international media, at least in most developed countries, is utterly failing to report on the ethical and justice dimensions of issues that are so central to achieving a favorable outcome in Warsaw. The failure of the media to continue to report on these issues almost guarantees that nations will continue to ignore their ethical obligations, a prospect which surely dooms the development of an adequate global climate regime. This is the first entry in a multi-part series which will first examine the ethical dimensions of major issues under consideration in Warsaw and then, at the conclusion of COP-19, report on what was accomplished in Warsaw on these ethical issues. 1. The extent to which nations make ghg emissions reductions commitments based upon “equity” rather than national interest alone. 2. The willingness of nations to agree to a new treaty that is to be completed in 2015 and that comes into effect in 2020 that includes a format for emissions reductions that takes equity and justice seriously. 3. The willingness of high-emitting nations to finance adaptation and climate change reduction strategies in vulnerable, developing counties. 4. The willingness of those nations most responsible for human-induced warming to agree to finance the value of losses and damages from climate change that can’t be avoided. 5. The extent to which some nations more than others are barriers to an urgently needed global climate change treaty. 6. The willingness of nations to accept a new climate change treaty that is sufficiently legally binding that it provides adequate sanctions for those who do not comply with their promises. The next entry in the series will look at the ethical issues entailed by the need for national emissions reductions commitments to be based on “equity” and “justice”.